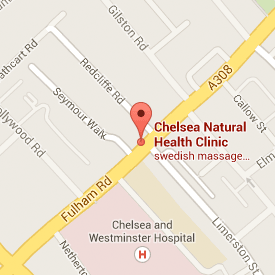 Khalda Mohammed BSc, Meical Herbalist in Chelsea at Chelsea Natural Health Clinic, Fulham Rd, London SW10. Herbal medicine uses plants that have naturally occurring medicinal compounds with therapeutic effects on human physiology. The effectiveness of plants to treat ill health is continuously validated by pharmacological research and clinical trials. The first appointment lasts about an hour and involves a detailed case history about the health complaint of the patient, past medical history, lifestyle, diet, allergies, body systems (respiratory, cardiovascular, digestive, nervous, musculoskeletal, urinary, gynaecological and skin) and past and current medications. The patient is requested to bring any medications including results of tests and investigations. After the case history a physical examination is performed with consent from the patient. If necessary the patient may be referred to their GP for further checks. A brief phone call is made before the initial consultation to see if herbal medicine will be suitable for the individual’s health problem. After a consultation the treatment is personalised to each individual. The aim is to optimise health with a holistic approach, to aid in self-healing by nourishing the mind, body and soul. Working with the individual, this is achieved by the use of whole plant medicines and advice on nutrition and lifestyle. Follow-ups appointments will usually be two weeks after the first visit to review progress. Further appointments are spaced out at four to six week intervals. Thereafter a longer time is usually left between consultations. Khalda has her own herbal dispensary and stocks mainly organic herbal medicine, from reputable UK herbal suppliers. Herbs prescribed under consultation are the safest way to use natural medicine alongside conventional drugs. Khalda Mohammed is a qualified and insured Medical Herbalist. She is a member of the College of Practitioners of Phytotherapy (http://www.thecpp.uk/), a professional body for Western herbal medicine practitioners. She follows their strict guidelines on ethics, practice and confidentiality. Khalda obtained a BSc in Herbal Medicine from the University of East London, an accredited degree programme by the European Herbal and Traditional Medicine Practitioners Association (EHTPA) (http://ehtpa.eu/), which included the study of anatomy, physiology, pathology, diagnostic skills, pharmacology, dispensing, nutrition, herbal medicine, and a minimum of 500 clinic hours. Khalda has a passion to help people improve their health and wellbeing. She continuously adds to her knowledge by attending educational events and keeping up to date with the latest evidence-based research in nutrition, plant medicines and lifestyle as well as developments in understanding of the root cause of health conditions. practise. The HerbMark is used by practitioners who are members of professional associations affiliated to the European Herbal and Traditional Medicine Practitioners Association (EHTPA), and whose members meet the strict standards of practice.